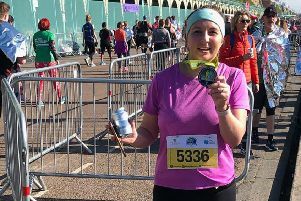 A keen Crawley runner, who is having to bow out of the London Marathon this year due to his cancer diagnosis, is urging others to take part in aid of St Catherine’s Hospice. Mark Lay, 45, ran the event in 2011 and 2013 for the Crawley charity and is receiving their care. He said: “The worst part of my illness is not being able to run, but if I can inspire you to support St Catherine’s then that’s the next best thing. “I might not be able to run anymore but it’d be a real privilege if you’d run for me. “I’ve always been a runner. I ran the London Marathon for St Catherine’s in 2011 and 2013 and the Brighton Marathon for them in 2012. “I never thought then that I’d be in need of their care myself just a few years later. “In fact, I probably ran at least one marathon with cancer without knowing. He will help anyone wanting to run for the charity. He said: “As soon as you join Team STCH, there’s a real team atmosphere and you won’t be alone. They help with training and fundraising, invite you to pasta parties and even put on a coach on race day to take you to the start line. If you choose to run for us, I and a team of people will be there to support you from start to finish and to remind you what a difference your support will make. His wife Tricia is one of the people he has already persuaded take up running. She said: “I’d never run before I started training; I couldn’t even run from the middle of the room to the door without doubling over. “I joined up with my friend, Sarah, and Mark trained us. We ran the marathon in a decent time of about five hours; everyone was so proud and people were so generous, we raised a lot of money and it was a really special time. “Mark says it’s one of his biggest achievements getting us round 26 miles. To find out more about supporting St Catherine’s call the events team on 01293 447355, email events@stch.org.uk or see www.stch.org.uk.